The BBQ Entertainment Unit by Keter is the best choice for your outdoor storage unit needs. It is an all-in-one solution that allows you to store up to 78 G of items securely. 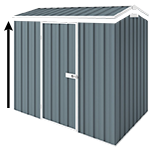 Looking for an outdoor storage unit that won’t take up a large space? The BBQ Entertainment Unit by Keter is the best choice. It is an all-in-one storage solution that can store up to 78 G of items safely. This unit is perfect for BBQs and other outdoor get-together activities because you can do cooking and serving while comfortably hosting. It comes in an appealing wood-like texture and it's made of the best resin plastic which is durable and waterproof, so you won’t have to worry about water damage or mould.